In photography as in drawing and painting, there are happy accidents. This photograph, above, was one of my photographic happy accidents. I must have taken about sixty photos of my white rhododendron. Many were on cloudy days and I was not happy with the contrast of light and shadow. The forms were alright but there was no “oomph” to the photos, nothing that made them sing. I finally got a sunny day while the blooms were still fresh and crisp, but all the photos that resulted were blaring with light. Yes, I was getting light, but the overexposure did not allow the shadows to delineate themselves as I wanted. 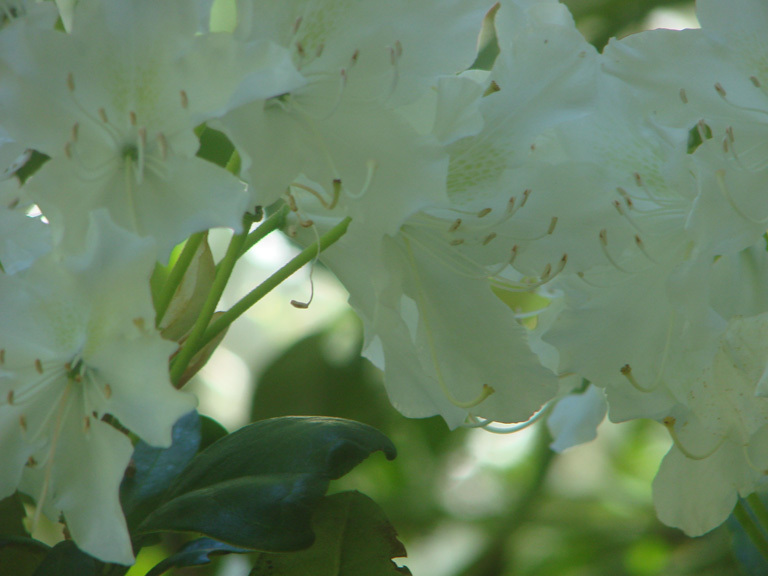 The camera didn’t seem to handle looking directly into the sun, even if there was a rhododendron bloom in the way. I managed to find a shady angle to shoot from and the camera seemed to like that better. Anyway, I liked the results better. The resulting photo (above) has less white, less clarity but somehow the gentle blueness of the overall effect is moody and there are subtleties of a warm yellow colour and some lime green lurking behind the pale-blue-or-is-it-green of the shadow side of the flowers. It works! With happy accidents, if we can figure out what happened, we have the likelihood of being able to reproduce the effect again and to use it to our advantage. In drawing and painting, learning from our happy accidents can be a real blessing. It can take us on a journey of exploration and even give a new direction to our work. In another medium, this time digital, I was scanning some drawings that I made at the theatre while listening to the symphony. My seat was close to the front giving me a very good view of the orchestra, but over to one side where the bass fiddlers were directly in front of me. I like the form of the instrument very much, and it being large, it was easy for me to see the detail of it. I’d come with the intention of listening, not drawing, but the desire to set down what I saw grew and grew. I just had to make a note of it. Of course, I hadn’t come prepared with any paper to draw on, but I had the program in my hand. 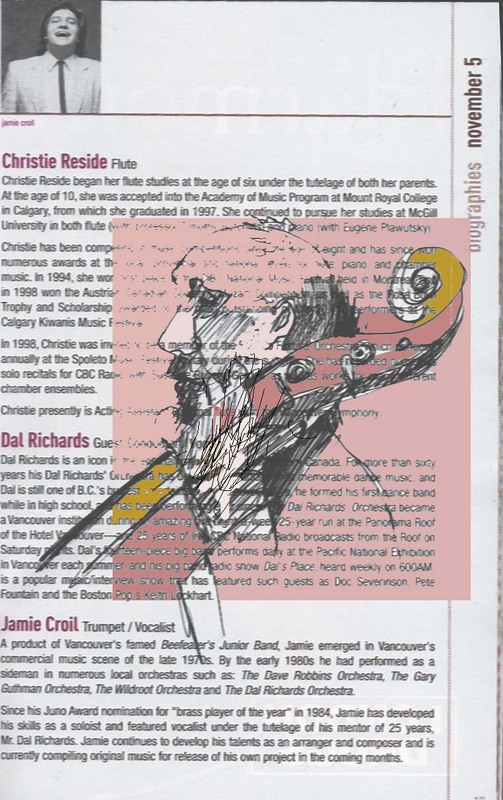 I flipped to a page that did not refer to the evening’s entertainment and began to sketch the fiddlers’ forms. Being close to the stage gave me sufficient light to draw with. When I came home I had a few primary drawings of a certain directness and liveliness. They certainly were far away from being finished drawings. I didn’t want to lose them; however, I didn’t want to hold onto the whole program in order to keep one page of drawings, either; so I decided to scan them and throw away the program. I knew I couldn’t ever make a finished drawing with the original. The paper was acidic. It was also glossy and unlikely to take any colour medium. I liked the drawing as it was, but I also wanted to see what it might be like if I added some colour. What better opportunity than to take the scanned image and try some variations with the program Paint or Adobe Photo? And so, on a copy of the image, I filled the face with a skin tone colour. If you’ve ever worked images with this medium, you will know that if your shape is not entirely closed off, the colour will “escape” out into the surrounding area, even filling the entire page if there are not any completely enclosed, shapes. I know this now because, when I filled the face with skin tone colour, the whole drawing became skin toned. The paint acts somewhat like a water leak. It spreads out the easiest way it can and unless it is dammed up, it floods everything. Now, the digital drawing medium is somewhat forgiving. When you make a move that results in something you didn’t intend and you don’t like it, then you can hit Edit, Undo and you go back to the previous stage. You can then fix your image so that it will do what you want (in this drawing, like closing off the head shape by adding a line where the “leak” occurs). Then you can proceed to re-fill the shape and hopefully it will be contained in the manner that you wished for. When I filled this drawing, I found that I really liked the texture that arose from filling the printed portions of the page with colour. The enclosed shapes of the letters did not allow the colour to invade, leaving tiny islets of black-rimmed white peppering the background colour. This happy accident – the filling of an shape within an image that spilled out into the text instead of staying within its own borders – led me to a whole new way of working. The first drawing was no prize winner, but the technique served me for many more drawings and a whole new type of imagery. I could go on, but I’m sure you know what I mean. If ever you have spilled ink on a drawing and then found, in trying to mop it up, that you have found something you didn’t intend but that you like, and you add to it, or disguise it. Then, next thing you know, you are spilling ink on purpose and getting backgrounds you like. Or a piece of plastic food wrap or of facial tissue falls on your painting and when you pick it up you have accidentally created a random texture you like; and next time you do it on purpose, in a more controlled manner. Or your painting has dribbles because the paint is too liquid for what you wanted to do and then you find that the dribbles add a dimension you hadn’t expected – but quite like…. Or, in figure drawing class, you don’t like your first charcoal sketch and you rub it all out; but since you don’t have more paper with you, you draw right over top of the first try; and you find that the rubbed in “ground” you have created actually assists your drawing; and next time, you start your drawing with a sketch that you intentionally rub out and then refine because the method gives your drawing more depth, more substance. If you are an avid sketcher, painter, drawer; If you are an impassioned photographer, you know these moments. You’ve been there before. You’ve had these epiphanies, these discoveries that you like and then start to use as a method or device. So, my friends, in a spirit of discovery, go play with your pencils, your paints, your cameras, or your computers and enjoy! This entry was posted on June 19, 2008 at 3:10 pm and is filed under abstract art, art, art for art's sake, art methods, art philosphy, chiaroscura, digital imagery, drawing, oil painting, painting, photography, representational art, shadows, sketch, Uncategorized, watercolors. You can follow any responses to this entry through the RSS 2.0 feed. You can leave a response, or trackback from your own site. Love the sketch. It really seems like it belongs on the program. The serendipity thing comes into play a lot in scientific arenas too. I guess anytime one is tinkering around on the edges, things start to happen. I can’t think of any good science type examples from my time on the chemistry bench. Mostly when my experiments went wrong they exploded. Maybe that’s why I am in computers now. I’m an advocate for the philosophy that links the creative thinking process of art and that of science. Besides which, many of the innovations in art were based directly on scientific discovery. During the Renaissance, for instance, the discovery of the optical lens, the microscope and the magnifying glass. Those wonderful Dutch floral paintings with bugs running all over them are a good exampleof the interest that occurred in seeing the minutiae of God’s creatures. The renewed interest in spatial geometry led to the emphasis on “realistic” perspective; to wit, the myriad pictures of ornate cityscapes in Italy. Not to mention, the illegal anatomy lessons that resulted in a completely new way of representing bodies in paintings – Michelangelo and Leonardo da V being the two giants of art that brought back this understanding to the art world (the ancient Greeks had been there before the Italians revitalized this knowledge in the 1400s. The Impressionists were implementing new scientific knowledge on optical perception and new understanding on how light refracts and breaks up. It would be an interesting thesis in the arts, to follow through history linking scientific discovery with the advances in art thought and theory. They’ve obviously made a gigachange on our society. It’s mind-boggling, what has changed in the last twenty five years since the popularization of the computer; and there’s no denying that art has put that instrument to work, making huge changes in Art.